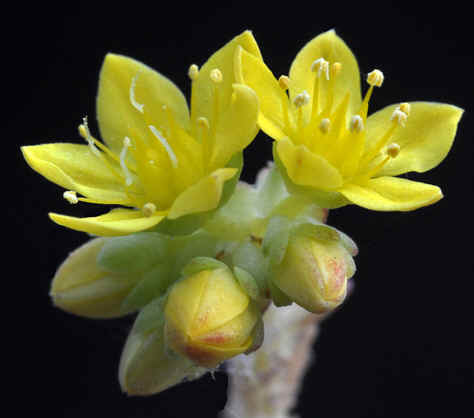 The cover picture shows an extreme close-up view (above left) of the flowers of Sedum greggii. Rather pretty but these flowers are just a few mm across. Reality shows a plant (above right) which has a neat rosette of stems until it flowers. Then the plant falls apart and fragments redistribute the species through your collection. Though never to the extent that some stonecrops can be a pest, (unless you are really clumsy). 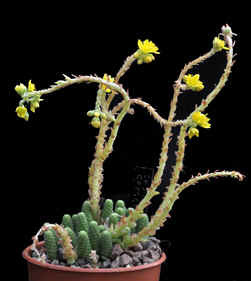 It is native to Mexico on shady cliffs. Here in NN country it enjoys sunshine and tolerates frost in a cold greenhouse if dry.